Goodreads Summary: In the violent country of Ludania, the classes are strictly divided by the language they speak. The smallest transgression, like looking a member of a higher class in the eye while they are speaking their native tongue, results in immediate execution. Seventeen-year-old Charlaina has always been able to understand the languages of all classes, and she's spent her life trying to hide her secret. The only place she can really be free is the drug-fueled underground clubs where people go to shake off the oppressive rules of the world they live in. It's there that she meets a beautiful and mysterious boy named Max who speaks a language she's never heard before . . . and her secret is almost exposed. Dystopian seems to be the hot genre this year, and with all of the books on the market, it is easy for the stories to start sounding similar. However, Kimberly Derting has avoided this trap with a refreshing story full of intrigue, danger, magic, and romance. In Ludania, everything is based on language. Your class defines your language, and you are not permitted to acknowledge someone of a higher class while they are speaking. Charlie, however, has spent her entire life hiding a dangerous secret: She can understand every language. She tries to go about her life as normal, but with members of the Counsel class insulting her and her friends, she finds it difficult. So when her friend Brooklynn suggests that they go to an underground club, Charlie readily agrees, desperate for distraction. Only there she meets a few people who will quite literally change her life - including the handsome, enigmatic Max. As the queen's oppressive regime tightens and the threat of war is imminent, Charlie will find herself in need of some unlikely allies and discover that not everyone is whom they seem to be...including herself. As someone who loves languages, I loved the premise of this book. Almost everyone is naturally bilingual, speaking both Englaise (the common language) and their class tongue. But even beyond that, The Pledge doesn't follow the standard dystopian plot. Yes, there is an oppressive government, but because it is set in a fictional country ruled by royalty it doesn't seem like something that could happen in the US. Add all that to Derting's writing style, and I was hooked from the very beginning. The story is brilliantly crafted - I could figure out just enough to appreciate where things were going, but there were other surprises that I never saw coming. Also, even though the story is told mostly from Charlie's perspective, there are moments where we get to see some of the other characters' points of view. I loved these insights, and they made the story come alive that much more. Then there were the characters themselves. Almost all of them were incredibly important in their own way. Charlie is an incredibly strong heroine, not one to easily give into others, and yet she has her moments of doubt that make her relatable. And then there is Max, who despite his mysterious air is incredibly charming. The chemistry between him and Charlie sizzles off the page. Even the queen, who is evil incarnate, has more than meets the eye. I have a hunch that things in the next book will be very...interesting. 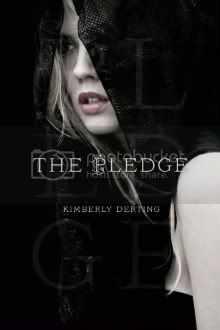 The Pledge is a book that you will not be able to put down. The mystery, the characters, the writing itself...everything is captivating. I cannot wait to read more! Yay! I'm so glad you liked it. I'm always scared reading the reviews, since it seemed to have gotten quite the love/hate relationship with people. I loved it too though! I agree with your review. ;) Great one at that!